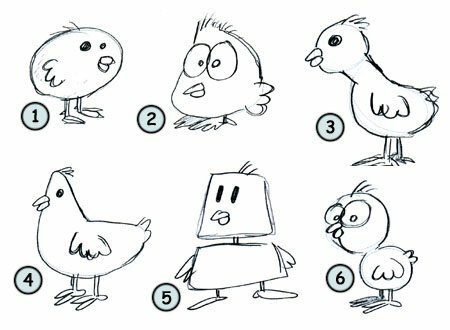 Drawing a cartoon chicken: some fun facts before starting sketching! A chicken will modify its calls when attacked by different predators. Chickens can fly on a very short distance only. The earth is populated with more chickens than humans. Before we practice to draw a chicken, let's study a little bit more the anatomy of this lovely animal. 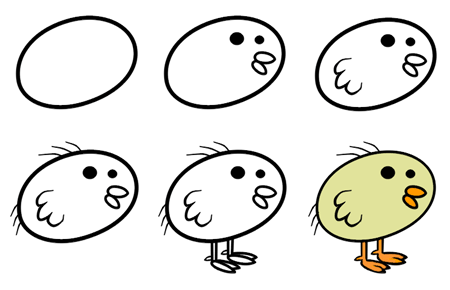 This little chicken has small wings (4) and a cute tail (3) made of feathers. The neck is rather long (5) while the beak is small (1). The shanks are tiny and each feet has three toes. Watch for the spurs on each foot. Decomposing our chicken into shapes shows us two main circles for the body and the head. Notice how the body looks like a big egg. On the other hand, the legs and the beak are made of several triangles and rectangles. The tail is not really big so a little rectangle will be enough. This example is probably the most funny one on this website. Start by drawing a circle for the head. Add some details like the eyes and the beak. Then, you can sketch a simple wing using one line. I've added some lines on top of the head and on the tail to represent the feathers. Draw the legs and add some colors to complete your masterpiece! 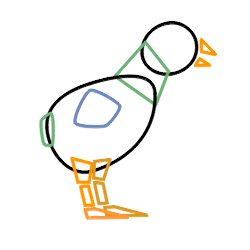 Once again, you can draw your chicken using rectangles (5), circles (6) or any other shape you think could fit your need. 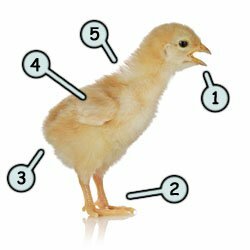 How to draw a chicken using some simple shapes is not a big deal once you study and understand this lovely animal's anatomy.